Today I did something I have never done in my entire life: I spent over 12 consecutive hours in a McDonald’s restaurant. To make the experience even more memorable, it was Thanksgiving Day. As a writing venue, this particular McDonald’s had several things going for it. Most importantly, unlike most of my usual haunts, it was open. Also, since this was a college town, it had been designed to accommodate students who needed a quiet place to work. Like most McDonald’s (hmmm….what is the proper way to pluralize a possessive proper noun? ), the main part of the facility had several televisions blaring and was not conducive to studying. But this particular McDonald’s, instead a playland for kids, has a large quiet study room, with a variety of seating options and plenty of electrical outlets. A glass wall seals the study room off from the noisy part of the restaurant. The one drawback of the quiet study room was the temperature. It was freezing!! Fortunately, I was somewhat prepared. I had multiple jackets, sweatshirts, and blankets. (I learned that lesson last weekend, when I had to borrow a writing blanket from a friend who lives in town.) I also had a pair of writing gloves (gloves without fingers). I purchased the gloves last night, in anticipation of a cold writing session. In the last six months, thanks to a kind husband and total immersion in the dissertation, I have only made a half-dozen or so visits to grocery/retail stores. One of those visits was last night, and it’s a good thing I did it. I should have looked for an electric blanket too. During the day, most of the McDonald’s patrons appeared to be college students. Some stayed quite a while (though I outlasted nearly all of them). I suspect I may have been the only one born and raised in the U.S.A. In the evening, the clientele changed…more teenagers and children. I wonder if they were getting ready for Black Friday shopping? A friend heard I was in town to write, and invited me to her home for Thanksgiving dinner. The friend, also a graduate student, understood perfectly that I could not commit to a specific time, that I might show up anytime or not at all, and that writing my dissertation took priority over eating a holiday dinner. 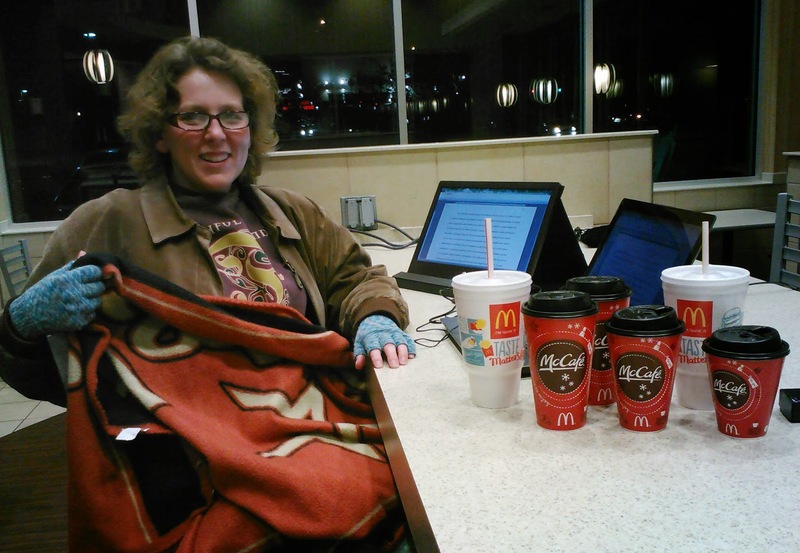 But apparently my friend’s mother was horrified that I was spending Thanksgiving at McDonalds’s. I think my friend had to forcibly restrain her mom from delivering turkey and stuffing to me. Speaking of moms, my mom and my husband ate Thanksgiving dinner together at Golden Corral, eighty-plus miles away. Since I ate under the Golden Arches, we were all together in spirit. 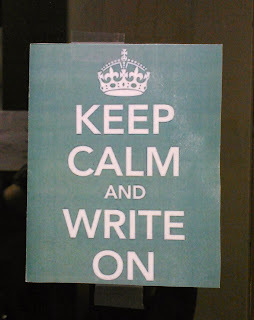 A year and a half ago, I wondered if I could find joy in the dissertation writing process. Today, I did. Important note: Only 56 minutes of writing time were used to create and edit this blog post. When I arrived at work yesterday, the sign pictured below was attached to my office door. So far, no one has claimed responsibility. I have several suspects in mind, and have begun inquiries. Regardless of who did it, I plan to obey. As my faithful readers have undoubtedly noticed, my little blog has been sadly neglected for the last few months. That question is currently under analysis. The preliminary findings of that analysis have already emerged, and I would love to share them with you. Unfortunately, I am prevented from doing so by the same root cause that produced the phenomenon under investigation (an enthusiastic blog-writer vanishing from her own blog). At a later time, after the situation causing the blogger’s blogging hiatus has been resolved, I will post a detailed report. In the interim, please be assured that I have not been completely idle. I have stopped drifting, and have kept myself busy by decorating, with the help of my investors. In the coming weeks, I hope to revive the blog from its coma through a sequence of short posts at regular intervals. Very strict time limits will be imposed on the generating and editing of these posts. Without such limits, the patient is unlikely to survive; if it does survive, its long-term outlook will not be positive. 10. Free cupcakes during finals week. 9. Free bacon and eggs at 9 pm during finals week. 8. 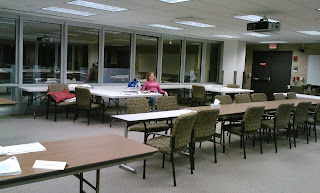 You can spend the night in the library during finals week (some students wear their pajamas). 7. No one minds when you spend 12-14 consecutive hours in the same restaurant, using the air conditioning, wireless, and electricity. 3. People feel safe enough to go jogging at 1:30 a.m.
2. Laundromat with attached restaurant/bar (Harvey Washbangers). Above the bar is a panel with numbered lights, one for each washer and dryer, so you can see when it’s time to leave the restaurant and switch the laundry. The french fries are pretty good too! 1. Laundry attendant who finds your lost kittycat sock in the dustbin and runs into the parking lot to find you and return it. On Writing Community (Part I): Rescued! I spent all of last Friday stuck in a bog; a bog of my own making. No, that’s not quite it. I did not create the bog, but I allowed myself to wander into it. Instead of paying attention to the ground immediately in front of my feet, my eyes were focused far ahead, trying to discern my path. I was looking for assurance that my current road would indeed take me to my destination, and not to a dead end, or to somewhere I did not wish to go. I was so busy looking for distant dangers that I missed the danger at hand. Before I knew what had happened, I was stuck. Like Bunyan’s famous pilgrim in the Slough of Despond, I struggled to move forward, then sank into darkness and discouragement. I did not intend for this blog post to become an allegory. But since it seems to be heading that way, I might as well give my bog a name — I’ll call it the Swamp of Statistics Fear. Now, please let me clarify… I am not one of those many graduate students who are terrified of statistics. I enjoyed my statistics classes, and I think I am perfectly capable of grasping statistical concepts. But my analysis requires some advanced techniques, combined in an unusual way, and I’m not sure exactly how to go about it. My perfectionism affliction affects all areas of my life, including my quantitative analysis. I want to thoroughly understand my statistical procedures, so I can write intelligently about them. More importantly, I want to avoid making mistakes and drawing wrong conclusions. In hopes of understanding exactly how to proceed, I have spent many hours reading, learning, and writing about what I’ve learned. Still, I am in a fog. I understand far more than I once did, but crucial connections are missing. And time is slipping away. Every day is precious, and I can’t afford to spend them floundering in the dark. I must get started, or I will never finish. When I fell into the bog Friday, I knew exactly what had happened. My fear of flubbing my analysis had paralyzed me. Immobilized by Fear, I couldn’t move forward, and not just on my statistics. I didn’t work on other parts of my paper, because I knew that my writing would serve as a statistics avoidance mechanism. I didn’t go for a run, because I hadn’t been productive and didn’t deserve recreation. My day degenerated into a total loss. Fortunately, as for Bunyan’s pilgrim, Help arrived. A friend, seeing me flailing to get free, offered to meet me at a coffee shop Saturday and talk through my statistics. Now, let me be clear — he was not there as a statistics tutor. He did not tell me how to do my statistical analysis. Though he has far more statistical knowledge than I have, he was not an expert in the particular techniques I was using. But he had something more important — a clear mind, a mind not hampered by personal investment in the project. He gave me sound advice, pointed me to some useful online resources, and reminded me to keep everything as simple as possible. Together we mapped out my next few steps, and decided at what point in the process I should call in a true expert (the statistics professor on my committee). My friend reminded me that although I could not yet see a clear path all the way through the analysis, I had sufficient light for the next few steps. I once thought writing was a solitary endeavor. Now I know better. Along this writing journey, I have been blessed with cheerleaders — friends who applaud my efforts, downplay my deficiencies, and celebrate my victories, however tiny. I cannot describe how much their encouragement means to me. But when you are truly stuck, a cheerleader on the sideline is not enough. You need fellow travelers who are willing to lay down their own burdens for a while, climb into the muck with you, get their clothes dirty, and drag you out. Thank you, my writing friends. Silver Taps: At last I understand. Once there was a grad student. She had a home and a job far away. She came to campus only for class, usually once a week. She did this for years, until she finished her classes. Then she didn’t come to campus at all. She didn’t understand the Aggie Spirit. Texas A&M was the institution at which she was enrolled, and that was all. She didn’t grasp the strange, almost cult-like kinship Aggies seemed to share, and even found it annoying. Why must they whoop at every mention of their school? And what are the strange motions they make with their hands? Who were these Texas Aggies? Did they really think they were better than everyone else? Perhaps she was a tad resentful, as people sometimes are when a circle closes, leaving them outside. Last year, she came to Muster. There she caught a glimmer of that unique bond that ties the Aggie family together. Years from now, when her dissertation is a distant memory, and her time on earth is done, would a comrade answer “Here” for her? Over time, the memory of Muster dimmed, buried by the busy-ness of life. But once started, such a spark could not be completely extinguished. Our grad student started coming to campus more, as often as her job duties allowed. She even made it to a football game. She can now sing most of the words to the Aggie War Hymn, as long as there is a strong singer nearby for her to follow. Still, she still often felt more like a visitor than a true Aggie. Tonight, she went to Silver Taps. Walking through the blackened campus, she had difficulty recognizing the buildings and wished she’d spent more time there. Unsure of her way, she strained to see shadowy figures far ahead, and followed them to the Academic Plaza. As a city dweller constantly surrounded by light, she loved the cloak of darkness—it dimmed sight but sharpened her other senses. Standing in silence, she thought of students she didn’t know—students snatched away, to the heartbreak of their friends and families. As she listened to the hymns tolled by faraway chimes, she was sad because she couldn’t remember all the words, and vowed to spend more time listening to hymns, and singing them. From the front row, she could see the Corps cadets, arrayed in silent vigil. She thought of all the planning and practice that went into this evening. Just turning off all the campus lights must be a huge logistical challenge. All this for two Aggies? Yes. Would they have done it for just one? Yes. Click…..Click…..Click. As the Ross Volunteers entered, clad all in white, she wondered…are they nervous? Are any of them praying they won’t make a mistake? …an error in timing, a slip of the hand on a rifle… There would have been no condemnation, of course; but still—no one wanted anything to tarnish the moment. And nothing did. As the bugles’ last haunting notes died away, she thought of respect, and loyalty, and honor. Fallen we are, full of selfishness and every bad thing; yet we are made in God’s image and thus we get it right at times. Tonight was one of those times. At last, at last she understood. Well, it’s gone. Over. Dead. My writing streak died last night at midnight, but I didn’t discover its death until lunchtime today, in Sbisa Dining Hall's underground café where I had settled in for a pleasant lunchtime writing session. I couldn’t decide between Chik-Fil-A and Mombo Subs, so I compromised, pairing a Mombo sandwich with CFA’s waffle fries. I opened my file to work, and I opened my writing log spreadsheet to document my session. Then, a shock: there was no entry for yesterday. I stared at the log, hoping to discover a mistake. I scoured my paper journal, to see if I’d written longhand without recording the date. I cast my mind through all of yesterday’s events, from getting up in the late morning, to the doctor’s appointment, to packing up my stuff, and driving to my College Station apartment for two days of self-imposed dissertation boot camp. I remembered settling in for a relaxing evening, catching up on emails and other miscellaneous dissertation-related tasks. I didn’t even open my writing log, thinking I’d written that morning. Somehow my dissertation-addled brain mixed yesterday morning up with the previous morning…I remembered an actual morning writing session, but my mind placed it on the wrong day. I could easily have written half an hour last night, without even staying up late. If only I’d known my writing streak was dying at that very moment, I wouldn’t have been so upset about shattering my beloved water mug in the apartment parking lot. Yes, yesterday was one of those days everything fell apart: me, my water mug, and my writing streak. I wonder, do other grad students occasionally have days filled with panic, when nothing goes well, and they’re terrified they won’t be able to finish? Hmmm, it’s probably just me. I must say, the writing streak has helped with that—ever since I developed a daily writing habit, my percentage of panic-filled days has decreased. A wise professor once advised me to voluntarily end my writing streak after a year. I wish I’d listened to her. I suspect she know I was bound to blow it if I kept going. She probably feared, with good reason, that if I failed at something so simple as writing every day, I would become very discouraged about my dissertation. I’m sure she knew it would hurt more to lose this writing streak than last year’s writing streak, which had only been with me for 145 days. I am keenly aware of how a small setback can snowball into deep discouragement, if you're not careful. Don’t worry, I have invested far too much in this little project to let that happen. I am determined to press on and not lose heart. Once I get past the momentary sadness, I’m sure I’ll see this in a positive light. Perhaps now, instead of being satisfied with spending 30 minutes a day writing about a building, I’ll chase some bigger and more meaningful writing goals. Important disclaimer: Except for a few small edits, I wrote the above portion of this post on Thursday, January 24, the same day I learned of my writing streak’s demise. As usual, I am running behind transferring my photos and posting my building blurbs. Bad habits are tough to break at the best of times…please cut me some slack while I’m in mourning. Oh, I almost forgot…this blog post is supposed to be about a building! I’m afraid I don’t have much to say about Sbisa Dining Hall. My writing streak’s death had rattled me, and my powers of observation were nearly nonexistent that day. 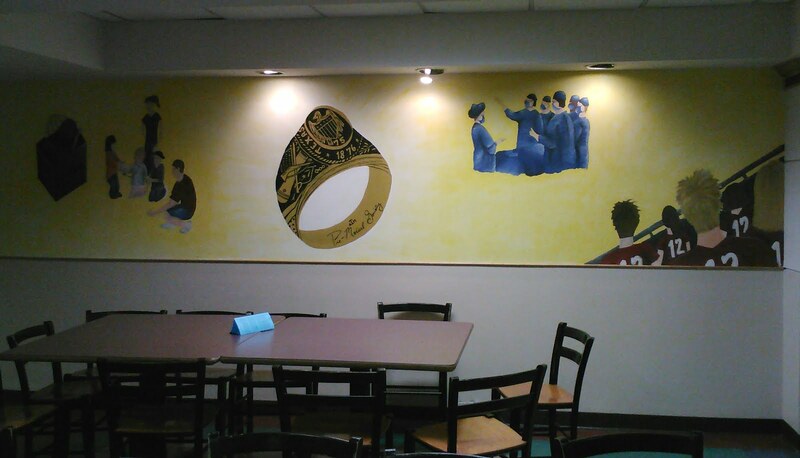 All I noticed about the Sbisa underground were the murals on the walls. I liked them. They were very well done, but not so well done as to be the work of a professional (at least I hope not). My guess is that they were created by a bunch of different student groups. Evans Library: Dissertation Boot Camp! What an amazing week. For four days, the University Writing Center staff locked us in a beautiful window-lined room in Evans library, so we could write, write, write. We each had our own big table, where we could spread out our books, research articles, and chocolate. Each day, our Writing Center friends treated us to an excellent lunch. They said that if we left to eat, we probably wouldn’t come back. As one camper said, “they took care of us so we wouldn’t have to take care of ourselves.” They even fed us afternoon snacks—writing is hungry work. Due to a hectic data collection semester last fall, along with some non-dissertation-related setbacks over Christmas break, my rate of progress had slowed nearly to zero in the six weeks prior to boot camp. I badly needed some momentum. I don’t think I could write 9-5 for more than 4 days though. By Thursday afternoon of boot camp, I was exhausted and my brain was fried. I couldn’t write a coherent sentence no matter how hard I tried. I’m pretty sure my fellow campers felt the same. But as tired as we were, we knew we had accomplished a lot in those four days. Three of us resolved to do our own unofficial boot camp, beginning the next Monday in Evans Library. Getting up at 7:30 a.m. is never easy for me, but I can do it if I know someone is expecting me. Over the last two years, I’ve written many times in Evans Library, usually staring at the wall of a small closet known as an individual study room. I’m very glad I waited until Dissertation Boot Camp to put Evans in my blog. Thank you, TAMU Writing Center! Me at my writing table. It looks dark outside because it is. It rained most of the week, so nobody wanted to go outside anyway. Wow, what fun! As I see it, there are three ways to spend our discretionary dollars: (1) stuff, (2) training/learning, and (3) life experiences. (Well, there’s also grad school…not sure how to categorize that.) Once upon a time, I leaned too much toward (1). Nowadays, (2) and (3) seem far more important, and I go back-and-forth between them. When I began this doctoral journey, Texas A&M University (my current institution) was in the same conference as the University of Oklahoma (my undergraduate alma mater). They faced one another in football every year. Unfortunately, as a graduate student working full-time 90 miles away, I did not make much effort to immerse myself in Aggie experiences. I genuinely meant to attend an Aggie football game eventually, but I just didn’t get around to it. (Not following through on good intentions is a habit with me…I’m working on it.) 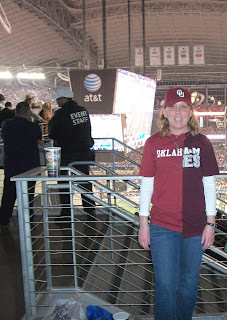 I especially wanted to see an A&M/OU game, and always resolved to buy a ticket…next year. Lesson learned: If there’s something you want to do, don’t wait until “next year”. The opportunity may be unexpectedly yanked from you. Before I got around to buying football tickets, Texas A&M abandoned the Big 12 Conference for the SEC (Southeastern Conference). All of Aggieland was thrilled. (Apparently joining the SEC is like getting a promotion— more prestige and more money than the Big 12.) I was very sad. Now A&M and OU would never play each other. But then, in December, a miracle: Oklahoma and Texas A&M would face each other in the Cotton Bowl!! Yea! A bowl game, within a reasonable driving distance. We just had to go. Skipping it was never really an option, even when we were only able to get Standing Room Only tickets. (Many thanks to my dear hubby, who drove to College Station at 4:30 a.m. and stood in line for hours to get them.) At $50 each, these SRO tickets were the most expensive event tickets we had ever purchased. I cringed at the price, especially considering we wouldn’t even be allowed to sit down. It turns out, they were a bargain. Such a large amount of pleasure, for only $50 (plus food, souvenirs, motel room, and gas). Fortune smiled upon me, and I found an OU shirt. It wasn’t great, it didn’t even say “Sooners”, but it would have to do. At least it was the right color of OU crimson. I already had an A&M shirt. I loved it, but knew I could replace it anytime. Most experiences of value require sacrifice. Yep, I cut it up. My Cotton Bowl outfit was created the night before the game. (Many thanks to my friend Denise, for her late-night sewing machine loan. My machine was broken, and wouldn’t even sew a seam.) My lack of seamstress ability definitely shows in the outfit, but that’s okay—I think the flaws add to its character. A professionally created split-loyalty shirt just wouldn’t be the same. Personally, I think the outfit turned out perfect in every detail. I even accessorized it well, with my OU and A&M necklaces. (I put OU on top, since I attended there first.) The outfit included both an Aggie hat and a Sooner hat. I switched hats based on ball possession. We drove to Fort Worth, checked into our hotel, changed into our Cotton Bowl outfits, and arrived at Cowboys Stadium in Arlington. (The Cotton Bowl football game is not played in the Cotton Bowl football stadium, which is about 25 miles away in Dallas). It was game time! I really didn’t care who won. I decided to cheer for whichever team had the ball. (My apologies to the defensive players…I had to have some system, and this was the best system I could think of.) I hoped for a close game with lots of lead changes…maybe even overtime! We saw one other fan with a divided-loyalty shirt. He was a boy, probably about ten years old. His outfit was better than mine, because his entire face was painted—half crimson, half maroon, logos included. His dad was a Sooner, and we chatted briefly, admiring each other’s gear. I wish I’d thought to ask his story—he sure didn’t look old enough for either college! I must confess, in the first half, my heart was with OU. This was partly because Cowboys Stadium seemed to contain a lot more Aggie maroon than Sooner crimson (I make no apology for my root-for-the-underdog instinct), but mostly because OU was my undergraduate university—the first college I ever attended. I have fond memories of OU football games, both of attending them, and of missing them to work the Engineers’ Club hamburger feeds. If you spend hours washing dishes during a football game, at least you’ll remember the experience. As much as I enjoyed my one Aggie game in September, it couldn’t overcome such nostalgia. But by the third quarter, it became obvious that the night belonged to the Aggies and Johnny Manziel. I sincerely wished the Sooners had shown up and been competitive, but it just wasn’t their night. Even in the first half, when the game was close, the Aggies seemed in control. During the entire second half, there was a parade of sad Sooners heading for the exits. We found a great place to watch the second half, in the far end zone on the uppermost (fifth or sixth, I can’t remember) level. We could see the giant screen facing the end zone, most of the ultra-giant screen facing the sideline, and half of the actual football field. We could even see the Aggie Band performing the four-way cross and block T. Spectacular. I’m glad I didn’t see or hear the Fighting Aggie Band before I attended OU at age 18…it would have dampened my appreciation for OU’s excellent Pride of Oklahoma show band. There simply is no comparison. We visited with some friendly Ags who had just graduated and found jobs. We all sang the Aggie War Hymn, locked arms, and swayed back and forth sawing Varsity’s horns off. After eight years as a graduate student, I think I am finally starting to grasp the Aggie Spirit. P.S. Make your best guess: Which hat did I wear on the way home? My outfit when the Sooners had the ball. Outfit when the Aggies had the ball. Notice that the cap actually says Sooners! After the game, the kind but strict ushers let us SRO folks stand by the seats for a picture. Well, I never expected such a thing, but it happened: I have joined that elite class of people who have a second home. But my second home is not a cabin, lake house, or bungalow on the beach. My second home is an apartment in College Station. I can now sleep within 10 minutes of campus, a wonderful thing. No more long drives to and from Houston early in the morning or late at night. My crash pad has a twin bed (a cot, really), a Poang chair from Ikea (have wanted one for years), and a borrowed craft table. It also has a couch and a flat-screen television. I feel rather guilty about that…my hubby convinced me that after a long day of writing, I might want to veg out in front of the TV. I think he just liked the prospect of the TV coming home when I graduate. He’s been hoping for years that our old Magnavox TV would die so he could get one with a flat screen. And of course, it refuses to cooperate. When I closed on the crash pad, I started thinking of what essentials I would need: Radio, water pitcher, trash bags…oh, I need a shower curtain! I browsed my usual shopping haunts. No, all the shower curtains were far too sophisticated for a college student’s apartment. A fabric shower curtain, whether subtle stripes or fancy florals, would never do. I waited patiently and on my next trip to campus, I went shopping. And I found it! The perfect shower curtain. And not only a shower curtain…a 7-piece Texas A&M bath set, all packaged neatly into an Aggie wastebasket. The shower curtain is all plastic, attached with cheap plastic hooks. No curtain liner needed. The toothbrush holder, tumbler, and soap dispenser cover nearly all my counter space. It’s just right! For hauling my dirty duds home on the weekend. It's perfect too! Wow, what a cool building! I know I’ve said it before, and it’s not very creative, but that’s what ran through my mind as I walked the Chemistry Building’s halls in search of a writing place. I chose this building semi-randomly, from the population of buildings near the Harrington Education Tower, site of my POWER writing group meeting at 5:00. The funnest buildings for writing are those whose identities are completely unknown to me when I enter them. Sometimes it takes me a while to figure out where I am—not this time. 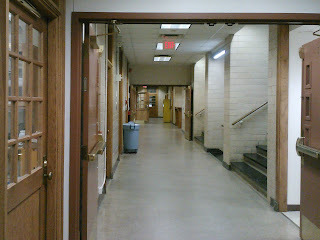 Within six steps of the door, the chemistry was obvious….chemical diagrams, labs, and hazard warnings were everywhere. The Chemistry Building was clearly not designed for writing—I walked the entirety of the main hallways of all three floors without finding a single chair, bench, or study cranny. During my futile search for a bench, I enjoyed reading the signs. On an elevator that didn’t look like an elevator: “This is a non-functioning elevator….for ADA compliant elevator, go to room ___.” On an ice machine: “Not for Human Consumption”. On a marker board: a detailed hand drawing of the building and surrounding streets/walkways, complete with stick figures, numerous arrows, and large biceps (on a stick figure). Everywhere: “High Voltage and Spill Control Kit”. On each floor: signs for the men’s and women’s restrooms, also with arrows. I followed the arrows to what appeared to be a dead end. I was scared to open the double steel doors, because they appeared to go to a lab. (I didn’t want to trespass.) I peered through the glass and saw no lab equipment, so plunged ahead. Sure enough, I found it: a well-marked door to a lovely, brightly lit restroom, nicely decorated with gray-and-white checkerboard tiles and shiny steel fixtures. 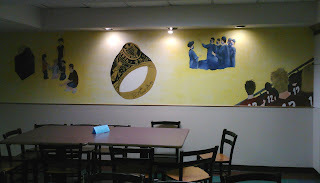 The place I wanted to write was the Arthur E. Martell lecture hall, because I wanted my one photo to feature the lecture hall lobby’s garish decorations. The floor’s intricate geometric tile design reminded me of American Indian art. The fancy brass moldings on the ceilings made me think of a normal house masquerading as a mansion. I’m not sure what the red leather-like door coverings decorated with rivets reminded me of... a dungeon? An old-timey western attorney’s office? 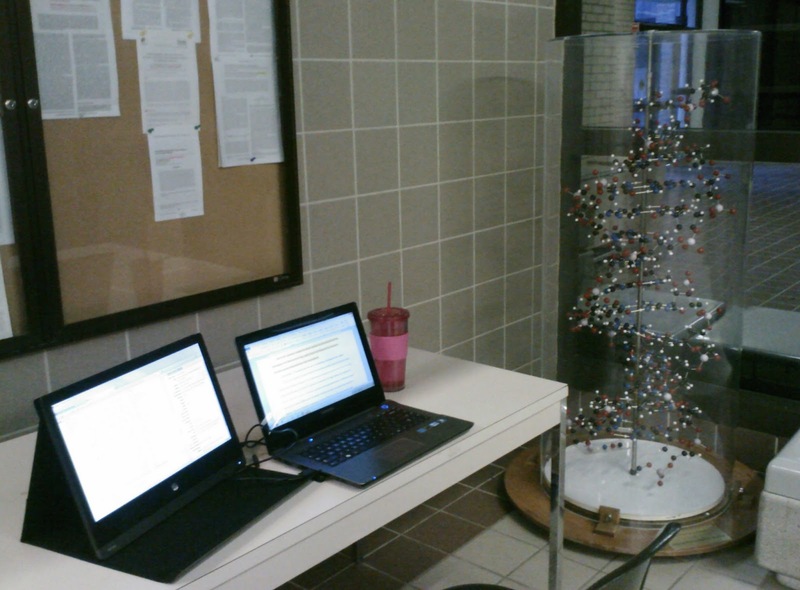 Anyway, none of the lobby decorations seemed to belong, either with each other or with the rest of the chemistry building. I couldn’t write in the lecture hall because it was being used for…guess what? A lecture. I do not claim to know the topic of the lecture, as I only saw one PowerPoint slide, which summarized the difference between realism and romanticism. Perhaps if I had stayed, the professor would have pointed to the giant periodic table on the wall and explained whether it fit best with realism, romanticism, or both. But no, I couldn’t stay. I had to fit in a writing session before my 5:00 writing group meeting, or I might get kicked out of the group. For the first time in my building-writing tour, and possibly in my whole life, I wrote for nearly an hour standing up. (I stood up for part of my Kyle Field writing session, because Texas Aggies are required to stand during football games, and I did not arrive in time to finish writing before the game started.) The best writing place I could find was a chest-high table outside a lab. A friendly chemist emerged and asked if I needed a door unlocked. (I’m sure he wouldn’t have actually unlocked anything without checking my credentials.) I told him that no, I was just waiting for someone, and asked if I would be in anyone’s way writing at this table. He reassured me and went back to work. (I practiced no deceit—I was indeed waiting for someone. I was waiting for me to finish my writing session.) I have heard that writing standing up is actually a good thing…it can cause your brain to function better, and of course, it burns more calories than sitting. Maybe I should do this more often. I was tempted to cave on my “one picture per building, visible from my writing location” rule. I so wanted to post the picture of the lecture hall lobby, as I was so proud of myself for managing to stuff the geometric floor, brass ceiling moldings, and riveted doors all into the same picture. I slept on it, and fortunately a cooler head prevailed. Nearly a year ago, I compromised my principles on the writing streak, allowing myself to count blog writing and rambling in my writing log. Like most who succumb to temptation, I justified it in my own mind, arguing that miscellaneous writing activity would provide useful writing practice and keep me from hiding from my dissertation. Disaster followed: my 367-day writing streak now controls my life, keeping me awake late at night writing about buildings, instead of sleeping so I can do meaningful research and writing. Even our sins and compromises have value, if we learn from them. So here is my one building photo, which includes my tall writing table. If you want to see the lecture hall lobby, you’ll have to visit in person (you’ll be glad you did.) 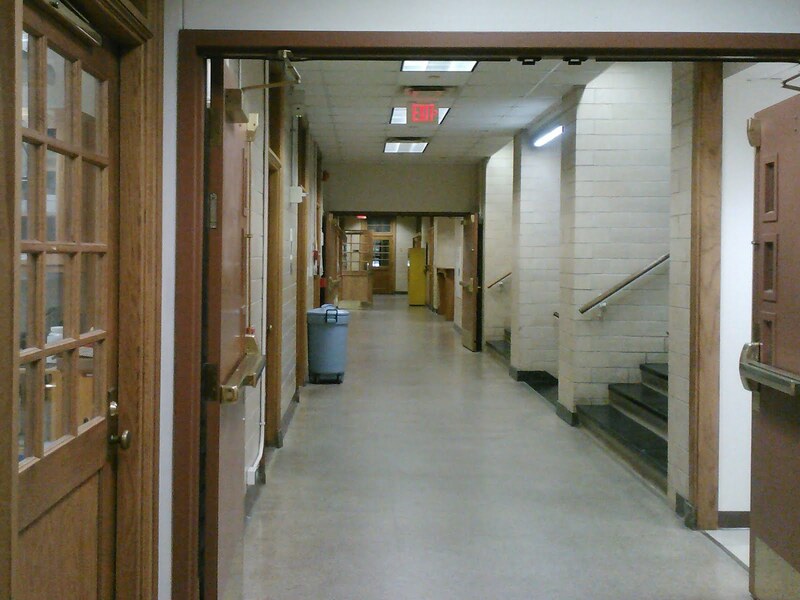 I love the Chemistry Building’s wood doors and moldings…they seem unexpected, almost quaint. They are certainly warm and welcoming. If I were a chemist who had to spend my life in a lab, I’d like the lab to be here. My writing table is on the right side of the hall, past the blue trash can but not quite as far as the yellow refrigerator. Whoo-hoo! In fulfillment of a New Year's Resolution, I am finally getting caught up with my overdue buildings! Note: Due to my perfectionism affliction and my incredibly hectic semester of data collection, I’m posting this over three months after my September 28 visit to Rudder Theater. I realize this is not the proper way to write a blog. After all, blog is short for “web log”, which implies that the blog should log our thoughts and experiences as we go along, not long after the fact. Fortunately, this is not a proper blog, so I can do whatever I want. My first visit and second visits to Rudder Theater had something in common: they both featured an expert in crisis management. The first visit occurred back in 2004, during my first year of this doctoral program. I had just donated blood at a campus blood drive. One moment I was walking to my next class, chatting with my husband on my cell phone; the next moment I was sprawled on my back in the grass, with no memory of how I got there. Leaning over me was General Van Alstyne, then Commandant of the A&M Corps of Cadets. He assessed my vital signs, noted the gauze strapped to my elbow, and recruited the necessary troops. He dispatched one student to inform the blood drive crew that a donor had collapsed. Another student assisted him in carrying me and my stuff to the nearest air conditioning, in Rudder Theater. After ten minutes spent horizontal on a theater lobby bench, I felt much more like myself. Soon I was on my way to class again, but I wasn’t allowed to walk—a kind phlebotomist ferried me to class in her own car. On my second and most recent Rudder Theater visit, September 28, I had the privilege of listening to another man with emergency-handling experience: astronaut Jim Lovell. Like nearly everyone, I have seen the movie Apollo 13. More than once. It’s the best kind of movie, the kind that takes an amazing story and somehow draws you into it, and makes you care how it turns out. But even better was the silent footage of Fred Haise, Jack Swigert, and Jim Lovell in the LEM, and the actual Mission Control folks in Houston, all narrated by one of the main characters. I started my writing session in the auditorium balcony after Jim Lovell finished his presentation, and finished it just outside the door on a bench. (It still counts, it’s still 30 consecutive minutes in Rudder Theater.) From the bench, I could look over the balcony and see an amazing wall of art. The wall is cover with a bunch of painted blobs. Each blob contains a landscape made of little pieces of wood. 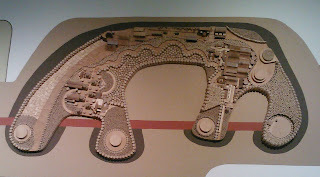 I wish I knew the story behind the Rudder Theater landscape wall, because it’s really cool. As with most of my building pictures, the photo does not do it justice.